Over the past few weeks I have been confronted with my own dissatisfaction with life. I am not smart enough, pretty enough or successful enough for my own preconceived, unrealistic standard of what a women in America in the 21st century should be. It's just so easy to focus on what you don't have instead of what you do have. It hit me this week...having the freedom that we do, allows us to set our own path. We were taught as kids that we could be whatever we wanted when we grew up and if I just want to have a little shop and raise a family, I can. 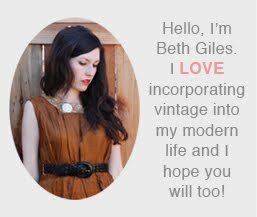 I do not have to be the President of the United States or the most successful online vintage retailer, I can just be Beth Giles, mother, wife and owner of an itty bitty vintage shop! Right now I feel free, free to enjoy MY life. I am sure a time of discontent will come again and I just hope I can remember these words I wrote. 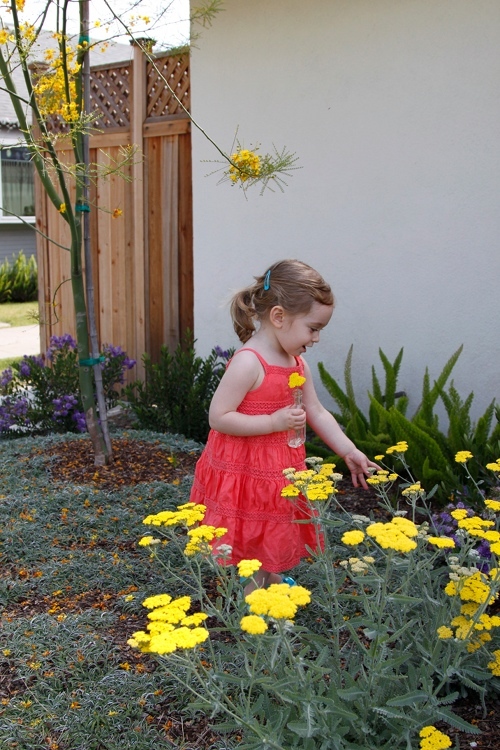 Some photos of last Saturday, picking flowers in the front yard with Ruby. My wonderful husband did all the work to make our front yard beautiful. What a lucky girl I am to have them both! Such a great post! Most of the time I am happy and satisfied, but in our highly informed and connected lives it is easy to feel 'less than' if we I'm not careful. Some days it helps to say out loud that I am enough; good, pretty, smart, talented and successful enough. I am happy to know that I am not the only one, and happy that you are finding the joy! yes, gratefulness certainly battles that demon of comparison. thanks for writing this. i think you are amazing and inspiring Beth! and that last picture of Ruby is beyond gorgeous - frame that! and that's why we shouldn't even try to compare ourselves to anyone else. It's hard to do (saying this as a college student where people complain about 4.0s..grr), but we really can't gauge our own lives with someone else's. It just makes you believe that what you already have is NOT special. Which is completely and utterly false. THANK YOU Beth for this post! This is exactly what I (and probably a ton of other women) need to be reminded of! You rock! Isnt it funny how we are never really satisfied with where we are at. I hit that spot all the time... and have the problem that the grass always seems to look greener on the other side! Recently though I was talking to a friend who is an assistant to a well known fashion photographer in Paris. She told me that here boss (the photographer) has recently been complaining to her that he isnt sure if he is any good at his job or if he even wants to be a photographer as a career. I thought it way interesting that even those who are who are wildly successful at what they do still second guess themselves and have insecurities!